Opposition activists and groups call for a civilian government to replace Omar al-Bashir, vow to continue protests. After months of mass anti-government rallies and a days-long sit-in, thousands of people poured onto the streets of Sudan's capital on Thursday morning in early celebration of what they hoped would be the start of a civilian administration. "New era, new nation!" chanted the protesters as word of President Omar al-Bashir's removal began spreading around Khartoum after state TV announced that the military was about to make an "important statement". But when the announcement finally came hours later, with General Awad Ibn Auf declaring the removal and arrest of al-Bashir and the establishment of a two-year, military-run transition government, the celebrations seemed to give way to anger and disbelief. "Nobody is happy," Nafisa Badri, a protester in Khartoum told Al Jazeera. "We don't want the army for another two years," she added. "People will continue to demonstrate." Announcing the move against al-Bashir, Ibn Auf, who was only recently appointed by the long-time ruler as vice president, also declared a three-month state of emergency and the suspension of the country's constitution. In separate statements, activists and opposition groups repeated their call for a civilian transitional government and vowed to continue taking to the streets until their demands were met. The Alliance for Freedom and Change, one of the groups involved in organising the anti-Bashir protests, accused Ibn Auf of engineering a "coup" and "bringing back the same faces and the same institutions which our people rose against". "We reject the statement of this regime's detractors," it said. 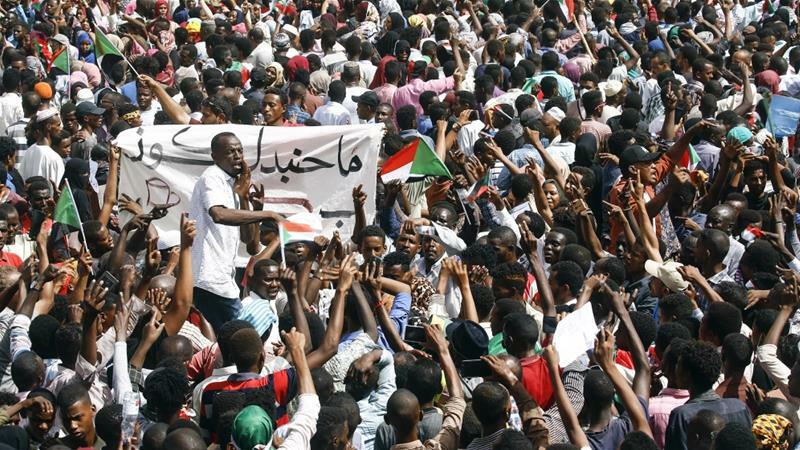 The Sudanese Professionals Association (SPA), which spearheaded the sit-in, also rejected the army's move as a "military coup" and vowed to hold further demonstrations. In a post on Twitter, the SPA said it was demanding the "handover of power to a civilian transitional government that reflects the forces of the revolution". The army also slapped a night-time curfew on the country, due to start at 10pm (20:00 GMT). But as night began to fall, it remained uncertain whether the crowds would disperse as ordered. Speaking to Al Jazeera from Kenya, Hajouj Kouka, a member of the anti-government Girifna resistance movement, said the group would also continue to protest until its demands for a political overhaul were met. Describing Ibn Auf's announcement as a "slap in the face", Kouka said: "The three-month state of emergency and two years transition is not what we were fighting for. This [Ibn Auf] is exactly who we are fighting, he was the vice president under Bashir and he is the system we were fighting." Ibn Auf was "the new enemy", Kouka said. "Right now we have the momentum … we are not done." Kouka said Girifna wanted a transition period managed by "technocrats" and overseen by an "army that will protect us rather than rule over us". He added: "We [the demonstrators] are very specific and united about this demand." The African Union said the military takeover was "not the appropriate response to the challenges facing Sudan and the aspirations of its people", while Antonio Guterres, the UN secretary-general, called for an inclusive transition that would meet the "democratic" hopes of the Sudanese people. Human rights group Amnesty International called on the military to respect the rights of Sudanese citizens. "We are alarmed by the raft of emergency measures announced today," said Kumi Naidoo, Amnesty International's secretary-general. "Sudan's military authorities should ensure that emergency laws are not used to undermine people's rights." "The transitional authorities must take all necessary measures to facilitate a peaceful transfer of power in Sudan," Naidoo added. Protests against al-Bashir, who took power in 1989 and is wanted by the International Criminal Court, erupted in December over rising food prices. They quickly evolved into demands for the 75-year-old's departure. Critics blame al-Bashir's mismanagement of Sudan's economy for high food prices, regular fuel shortages and widespread cash shortages. Dozens of people have been killed since the demonstrations began, including children, medics and soldiers, some of whom were attempting to protect protesters from a crackdown carried out by security forces loyal to al-Bashir. Before his removal, al-Bashir said the economic concerns raised by protesters were "legitimate" but argued his opponents should seek power through the ballot box when his term was due to end in 2020. "It's increasingly clear that a military government, with or without al-Bashir will neither have the political or economic resources necessary to address the crisis of legitimacy in the country, and the crisis facing the economy," Payton Knopf, of the Africa Program at the United States Institute for Peace, told Al Jazeera from Washington, DC. "So, we are potentially looking at a very unstable road ahead."